Open from 12 p.m. to 9 p.m. (soft opening). Regular operating hours are from 11 a.m. to 10 p.m. 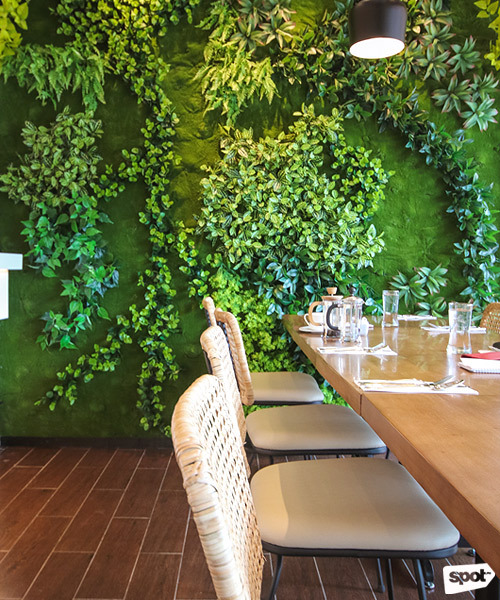 True enough, with the light streaming in from the windows and drenching the room, it is a place that would make you want to linger over a plate of their best-selling dish. 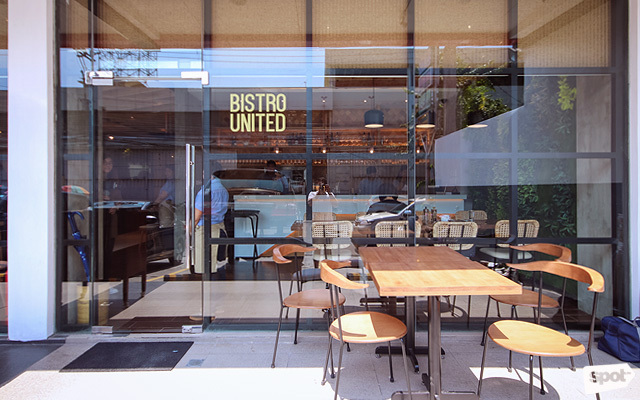 But don’t let its innocent, cheerful looks fool you—Bistro United’s menu is brewing a revolution. And that’s exactly what she does. The Crispy Ubod Salad (P125) is meant for the non-salad eater. It’s composed of heart of coconut palm, carrots, squash, and kamote beans in a wanton crisp. 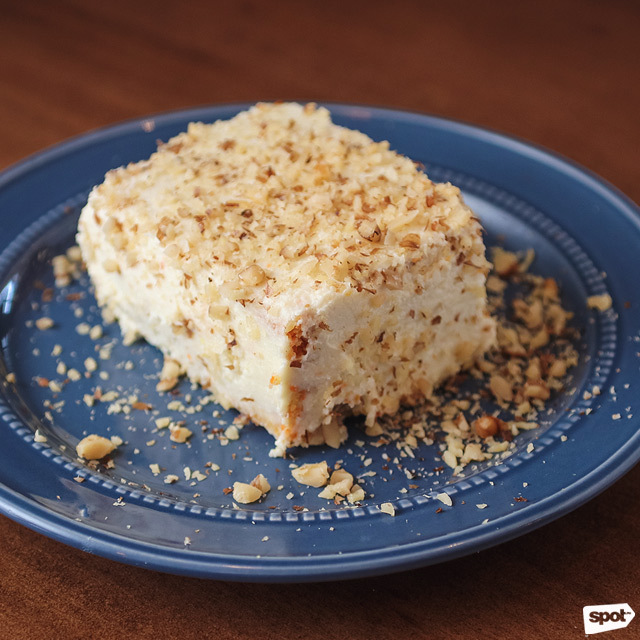 One serving is a stack of four pockets topped with candied Iligan nuts, with dressing on the side. While you can eat it piece by piece, Chef Mia recommends slicing through the stack and including the nuts in your forkful. Tart splashes of vinaigrette and sweet pops of candied nuts fight for attention in one delicious medley in your mouth. You’ll never look at lumpiang ubod the same way again. The grilled cheese sandwich takes a Filipino turn in the Grilled Cheese Dunkers (P155). 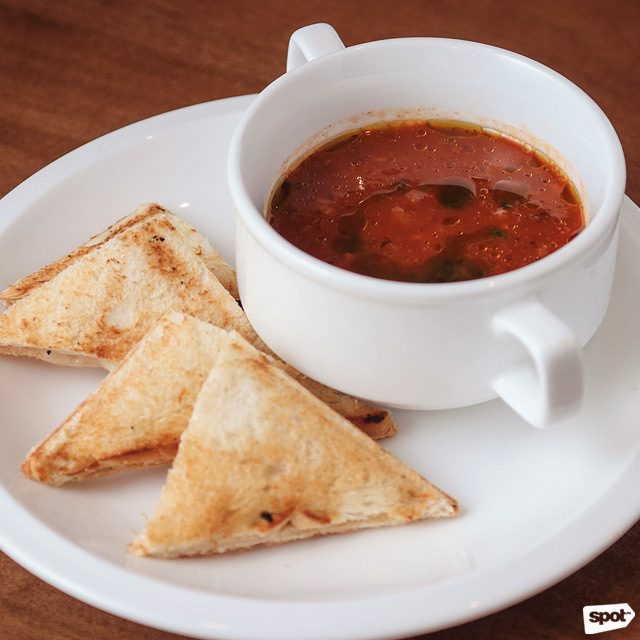 It’s a kesong puti sandwich pressed panini-style, and accompanying it is a bowl of homemade tomato soup. You can eat the sandwich and slurp the soup one after the other, but for maximum flavor, let the dipping party begin! How can a bowl of pasta be crunchy? 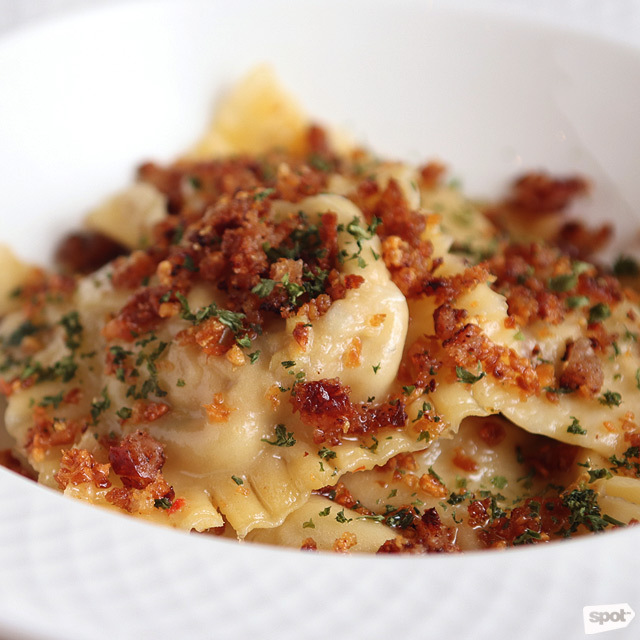 It can be, when it’s ravioli filled with sisig and bagnet, topped with bagnet chicharon bits! 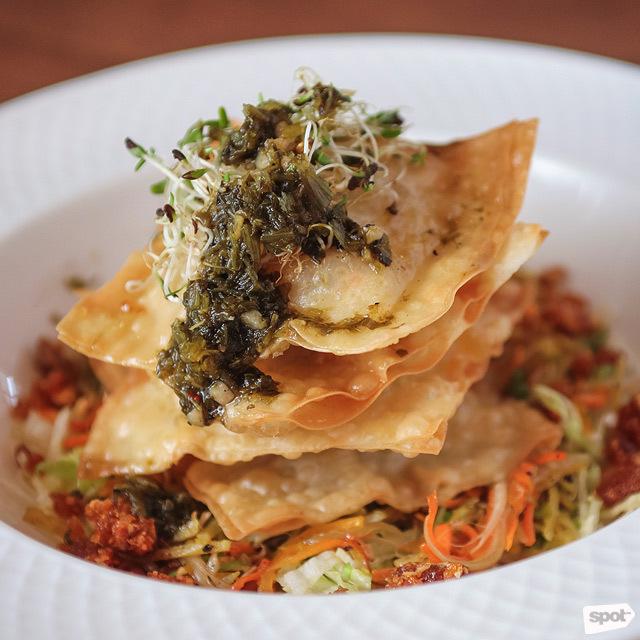 While Chef Mia likes it drizzled in olive oil, you can also order the Bagnet Ravioli (P245) with creamy aioli sauce. Sink your fork into The Amazing Roast Beef (P415), slices of U.S. prime roast beef belly that’s been marinated for 12 hours and roasted from six to eight hours on low heat. Tender and tasty, it’s served with au jus gravy. Whether with mashed potatoes or rice, we’re sure that it will be the first plate to be wiped clean on your table. 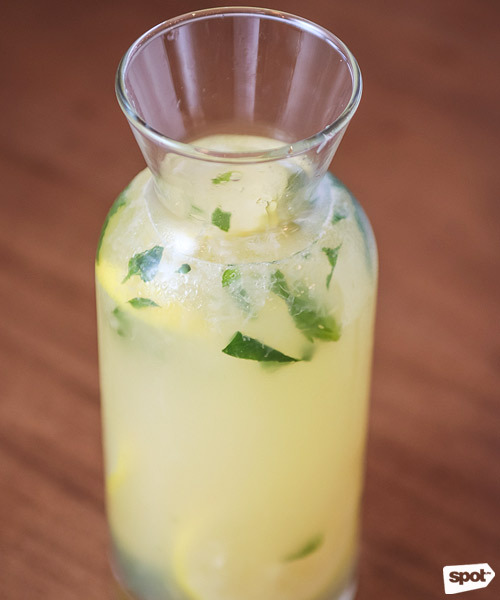 Wash everything down with the refreshing Basil Lemonade (P199/carafe), and then experience different layers of flavors in Adobo sa Mangga (P395). 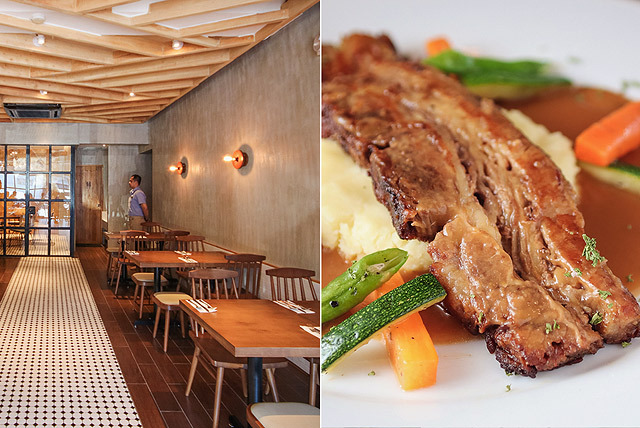 A Bistro United specialty, it’s adobo with bagoong instead of soy sauce, and mango puree instead of vinegar. 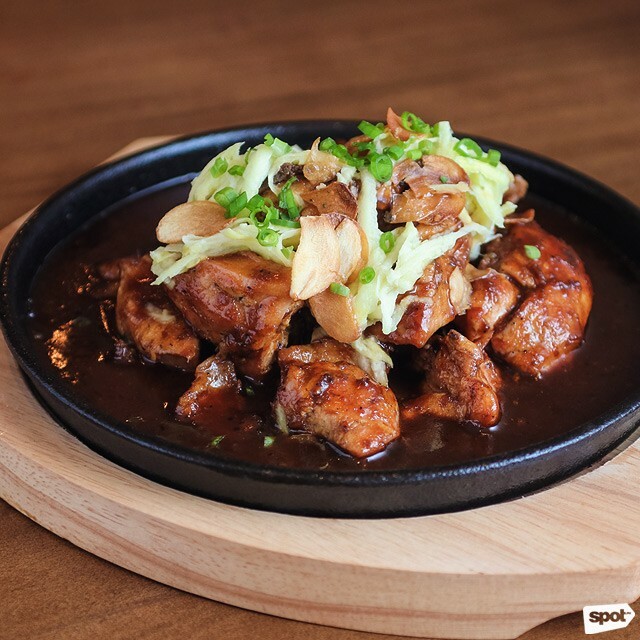 The chicken is grilled first, sautéed, then placed on a sizzling plate. Topped with green mango and garlic, this one will most likely become a crowd favorite. 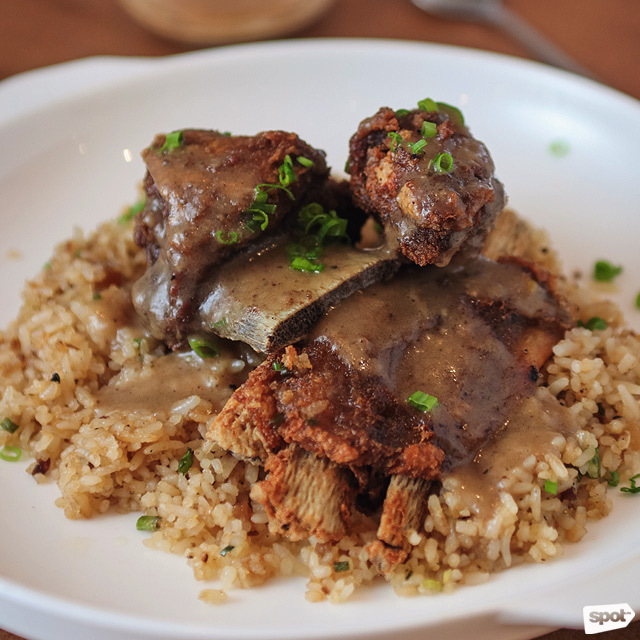 Reward yourself with the Crispy Ribs with Bone Marrow Rice (P295). If it’s mouthwatering crispy tadyang with bone marrow rice and gravy that you want, that’s exactly what you’re going to get. Ube has been finding its way into many different recipes both here and abroad. Bistro United showcases the local ingredient in their ube rice, which accompanies an order of the dalandan chicken. The chicken, flavored with dalandan marinade, harmoniously blends with the sweetish taste of the rice with its grated fresh ube. 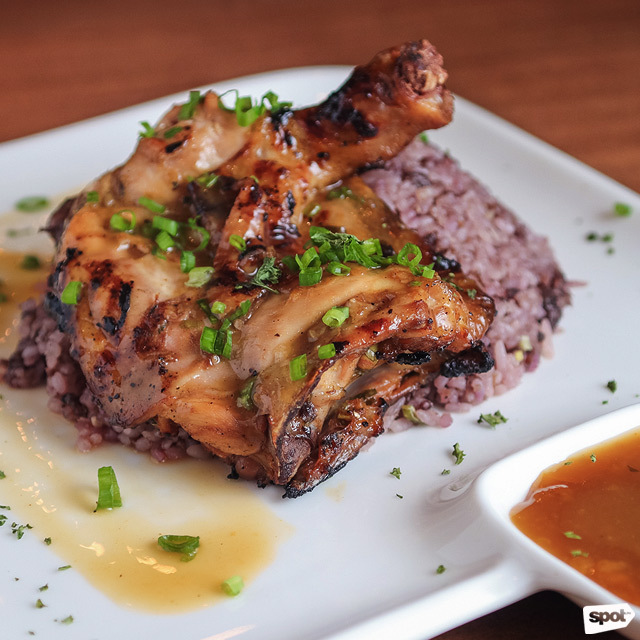 A sweet citrusy sauce complements the dish, making Dalandan Chicken with Ube Rice (P245) a winner in our book. 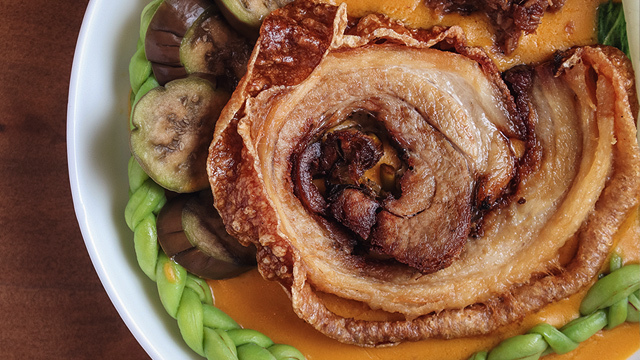 The Porchetta Kare-Kare (P345) is an instant hit. 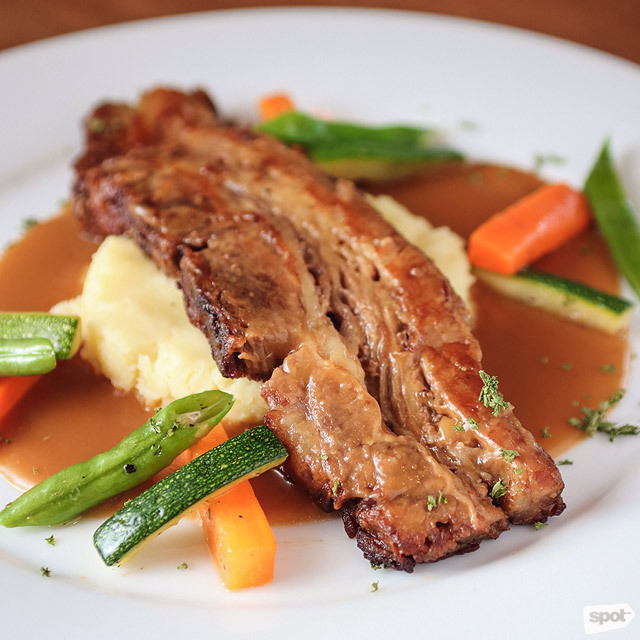 The savory pork is tender, while the skin is light and crunchy. 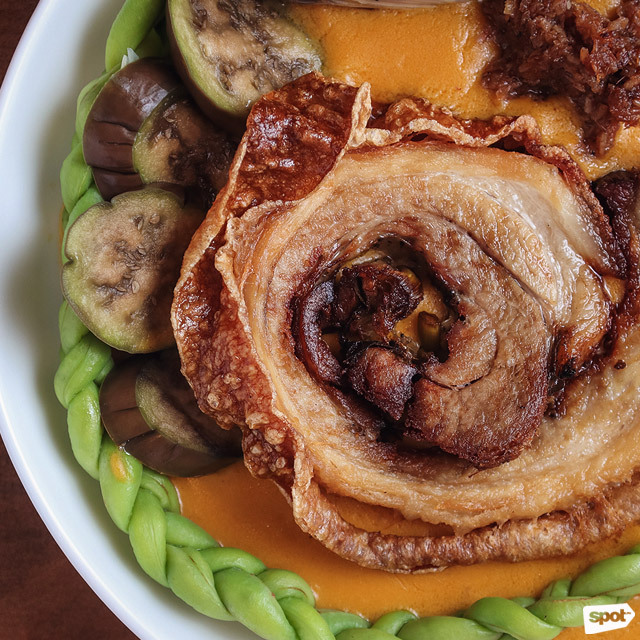 Delectably rounding off the flavor and texture is the sweet, velvety kare-kare sauce, which Bistro United makes with peanuts and not just peanut butter. 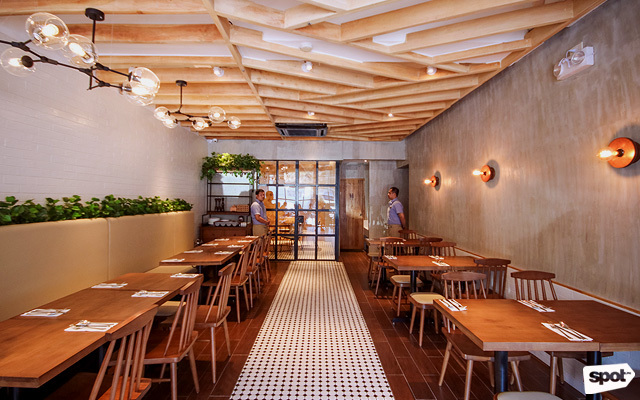 You’ll be ordering extra rice in no time. The Fried Chicken Sandwich (P255) looks intimidating, but you’ll find yourself scarfing it down in a jiffy. 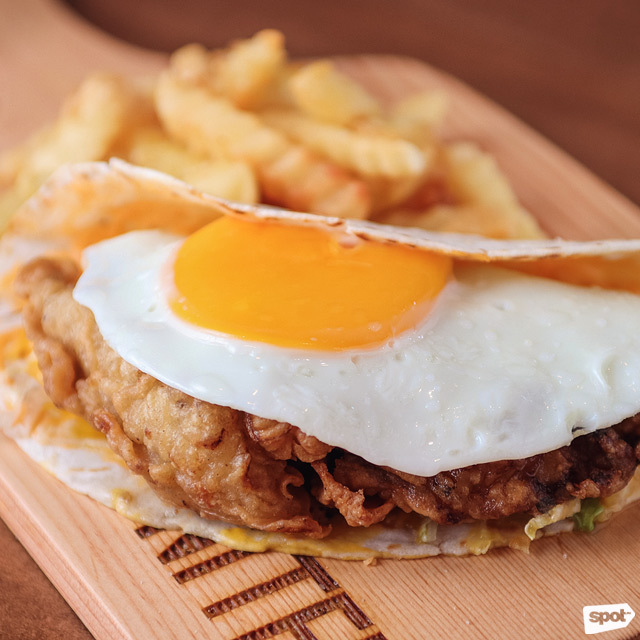 Once you’ve started, you've just got to have more of the crisp-fried boneless chicken fillet and its pita bread with melted cheese, Sriracha mayo, and fried egg. 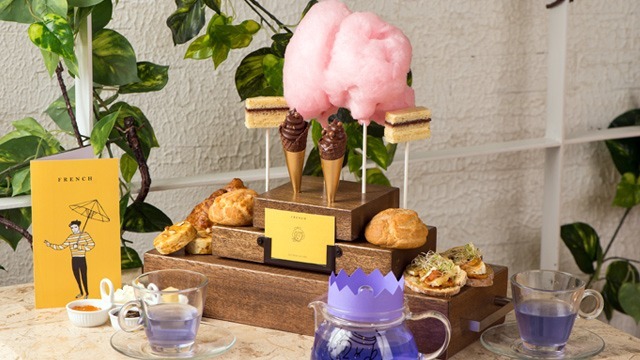 Vehemently against non-chocolate desserts? The Gold Medal Carrot Cake (P175) will change your mind. 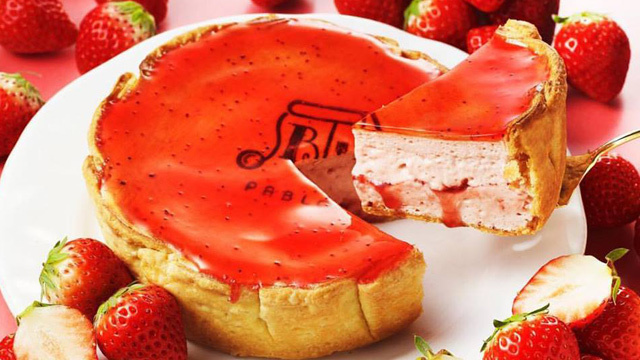 Delightfully moist, it’s got enough cream cheese to make you daydream about it the next day. We’re sure you’ll be discussing the Tilapia Ice Cream (P55/scoop) long after you’ve left the restaurant. It’s sweet and savory at the same time, with chunks of tilapia to jolt your palate every now and then. 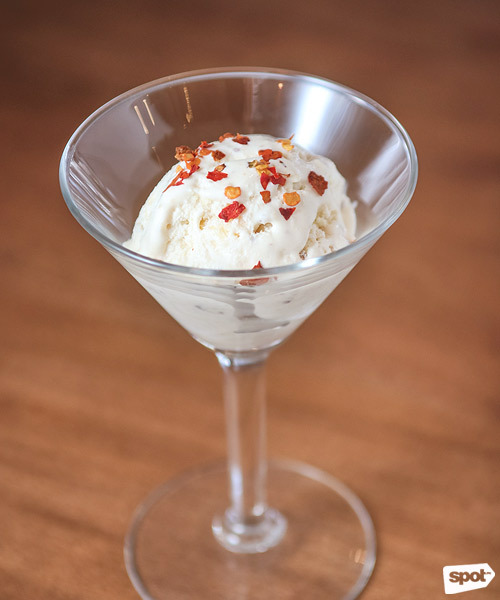 You’ll find yourself digging into your scoop, chasing after an exquisite harmony of flavors carefully balanced by the sprinkle of chili flakes.